The loudest voices often get the most attention, but sometimes it’s the quieter ones that are more interesting. The Swing Era was filled with exciting big bands that roared, shouted and pounded, but some of the most satisfying musical sounds of the day came from the delicate and restrained orchestra led by xylophonist Red Norvo. This week on SDPB Radio’sBig Band Spotlight, we’re featuring the soft and subtle but still swinging Norvo Orchestra. It wasn’t a big commercial success, yet few groups could match its musical brilliance. Although the Norvo band’s subdued approach was unusual in a musical world filled with brash brass and driving rhythms, what was even more peculiar was Norvo’s xylophone, one of the more unlikely jazz instruments. Norvo’s first instrument was the piano, but at the age of 13 he heard a man playing the marimba in a theater pit band and was immediately transfixed by mallet instruments. He took a summer job until he earned enough money to buy a xylophone, which he quickly learned to play. In the early 1920s the xylophone was a popular instrument in vaudeville shows and Norvo joined a mallet instrument octet touring the vaudeville circuit called “The Collegians.” But at the same time he was playing novelty music for vaudeville audiences, Norvo was drawn to the sounds of Louis Armstrong, Bix Beiderbecke, Earl Hines and other early jazz musicians. From vaudeville he moved to the popular orchestras of Victor Young, Ben Bernie and then Paul Whiteman, the most famous bandleader of the time, with whom he became a star soloist. Norvo left Whiteman in 1933 and started making a handful of adventurous and daring records under his own name. Two years later he was leading a band in New York City at the Famous Door on 52ndStreet, a hotbed of jazz. Norvo told writer Richard Sudhalter many years later that he never wanted to be a bandleader, but came to realize that was the only way he’d get to play what he wanted to play and do things the way he wanted to do them. Norvo’s band featured four horns, guitar and bass. Instead of jamming on tunes like other 52nd Street groups, it featured horns playing in soft, close harmony. Helping shape the band was Julliard-trained trumpeter and emerging arranger Eddie Sauter. In late 1935 Norvo got an offer to play the summer season at one of New York’s big hotels, the Commodore. He expanded his band to a twelve-piece, but the soft and subtle approach remained. There was a good reason the Norvo orchestra’s music had to be subdued: the xylophone couldn’t be heard over shouting brass and pounding drums. The xylophone has wooden bars and when struck by a mallet, aren’t very loud and don’t sustain. 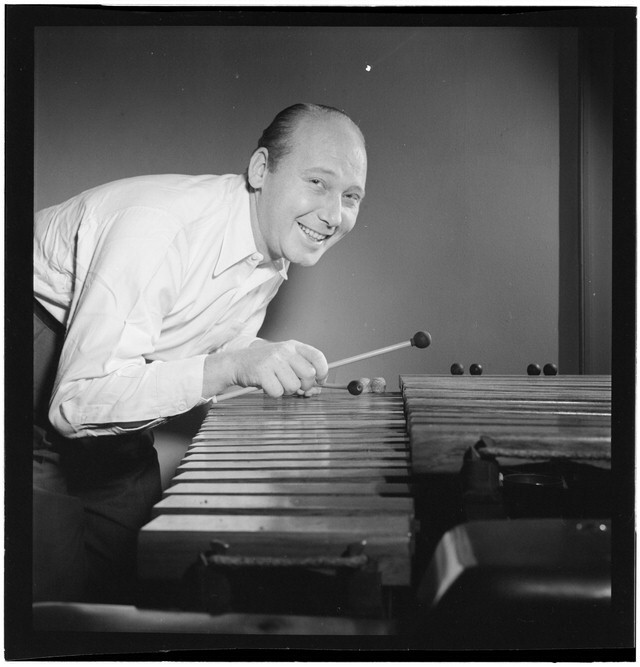 But with arranger Eddie Sauter’s deft use of dynamics and space, Norvo’s xylophone was successfully integrated into a big band context. All big bands had to have a “girl singer” and Norvo’s was Nancy Flake. But Norvo was married to one the great jazz and pop singers, Mildred Bailey. They met when they were both working in the Paul Whiteman Orchestra. Bailey had a small voice, but it was more strong than delicate, and she could swing. She recorded on the enlarged Norvo band’s first records and sang on the group’s radio broadcasts. Soon she was a member of the band and Nancy Flake was forgotten, except by band drummer Maurice Purtill who married her. Although Bailey was the band’s star attraction, she was also, by most accounts, its undoing. She was a troubled woman who was unhappy and insecure about her weight and appearance. She could be warm, funny and affectionate, but she also had a sharp tongue and violent temper and could be very difficult to work with. One of Norvo’s saxophonists said she was a disrupting influence fomenting discord within the band. 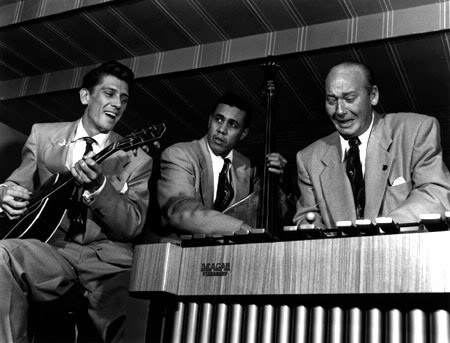 Big band historian George T. Simon, a Bailey fan, wrote that she “often asserted herself too emphatically, creating tensions that were anathema for a band that relied so much on a relaxed approach.” Simon observed that Bailey’s behavior brought Norvo down and stifled his sensitive, outgoing personality along with his and the band’s enthusiasm. By the fall of 1938 the Norvo band wasn’t quite the same group as it had been. Most of the original musicians were gone and Simon complained in Metronome magazine that the band’s “soft, subtle, swing” had changed. “The soft has disappeared almost completely,” he wrote. “The subtle has been minimized. But the swing remains.” This more assertive style was at least partly the result of pressure from people in Norvo’s booking agency who wanted the band to sound more like Benny Goodman or Artie Shaw. A few months later Norvo reformed the band, although the only returning member was loyal bassist Pete Peterson who had been with Norvo since the Famous Door days. 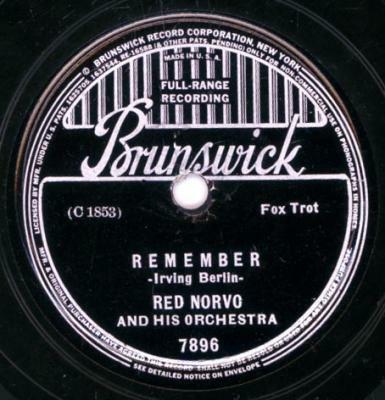 This edition of the Norvo orchestra lasted just a few months, but Norvo was back at it again in 1940 with a band playing the old Eddie Sauter arrangements, which gave hope to some fans that Norvo’s soft, subtle swing had returned. But this band wasn’t very successful either and the xylophonist was forced to scale back to a smaller group. But things still didn’t work out, so he disbanded once again and got some of his musicians jobs in a new group led by pianist Claude Thornhill. Like Norvo’s original band, the Thornhill orchestra’s approach was based on soft swing and subtle dynamics. But then Norvo put together yet another band: this one a group featuring six brass and five reeds and a new book written by arranger Johnny Thompson. Again Norvo bucked the dominant riffing big band approach, this time with a band dominated by woodwinds. The saxophone players doubled on flutes, bass clarinets, English horns and oboes. The band got some favorable notices, but by the summer of ’42 the military draft was taking so many musicians that Norvo was forced to scale back to an octet and was back at the Famous Door. Meanwhile, Norvo’s marriage to Mildred Bailey deteriorated and even though they still worked together, they divorced in 1945. The former Mr. and Mrs. 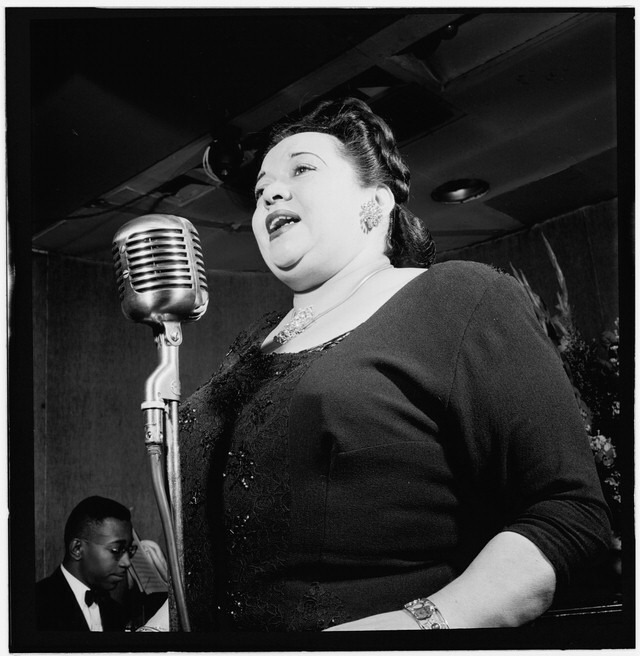 Swing remained friends and long after Bailey died in 1951, Norvo continued to defend her, telling writer Richard Sudhalter in 1988 that she wasn’t a disruptive force in the band. She was a perfectionist, he said, and any friction that arose was because she wanted things right. Although Norvo’s days as a big band leader were over, his career in some ways was just beginning. He switched from xylophone to vibraphone and played in Woody Herman’s exciting First Herd and the Benny Goodman Sextet. In 1949 he formed a trio with guitarist Tal Farlow and bassist Charles Mingus that was one of the more remarkable and innovative small groups in jazz history. Norvo continued to perform into the 1980s until a stroke ended his playing. He died in 1999 at the age of 90. 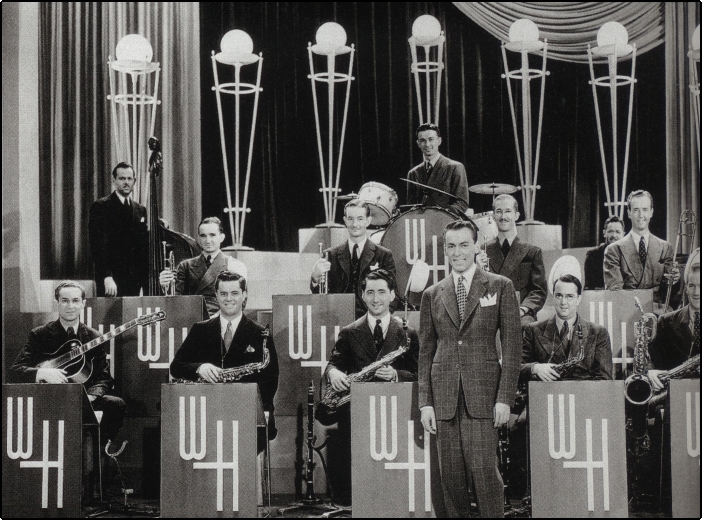 Few big bands were quite the extreme study in contrasts as the Tommy Dorsey Orchestra of the early 1940s. It could blast the roof off with high-energy swing and then turn around and play the lushest, most romantic sounds imaginable. And with great singers and musicians like Frank Sinatra and Buddy Rich in the band, the Dorsey Orchestra created some of the finest musical entertainment of the day. 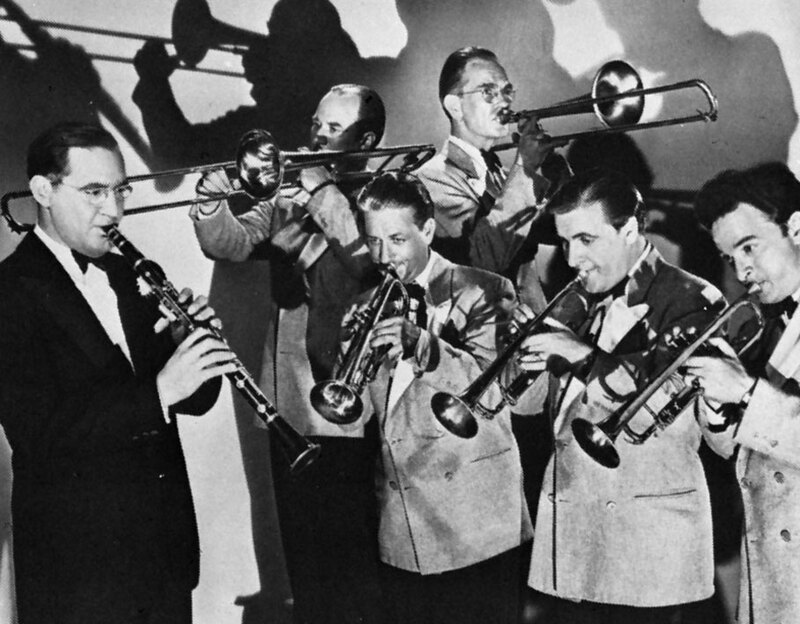 This week on SDPB Radio’s Big Band Spotlight, we’re featuring music from Tommy Dorsey’s remarkable orchestra of 1940-42. It’s a band that, in my estimation, ranks among the ten finest groups of the Swing Era. This Dorsey outfit wasn’t just a dance orchestra, but a musical variety show. Like all the top bands of the day, Dorsey worked just as much in theaters as ballrooms, playing stage shows between movies. While the “sweet bands” of Kay Kyser, Horace Heidt and others specialized in musical entertainment designed for theater engagements, Dorsey’s was one of the few swing bands that did. Glenn Miller’s did too, but not at the same level of musical excellence. By 1940 Tommy Dorsey had been one of the most successful bandleaders in the country for a half-decade, racking up dozens of hit records. But despite its popularity, the Dorsey band, other than the leader’s pretty trombone, wasn’t all that special. It cranked out hundreds of dull, pop tunes that all sounded more or less the same. Its jazz instrumentals were often stuck in an old-fashioned, two-beat Dixieland rut. Dorsey knew he needed to freshen his approach if he wanted to maintain his popularity in the increasingly crowded and competitive big band field. His first move was hiring arranger Sy Oliver away from the Jimmie Lunceford Orchestra, one of the greatest and most admired African-American bands of the thirties. Oliver and Dorsey revamped the band’s book and within a few months almost completely overhauled the personnel. The band now had a totally new musical personality, dramatically changing from a sluggish, middle-of-the-road pop group into a thrilling, modern jazz band. 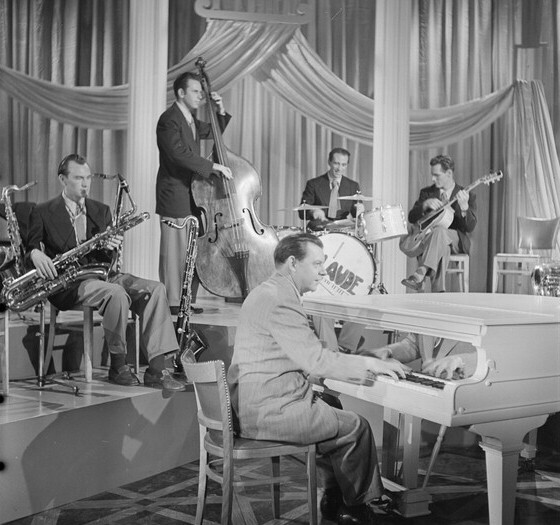 Tommy Dorsey's band in a still from the 1941 movie Las Vegas Nights. With Oliver on board, Dorsey was able to entice master drummer Buddy Rich away from Artie Shaw, just before the clarinetist ran away to Mexico. With his technical skills and extroverted personality, Rich gave the band an unrivaled power and drive. But that was just one side of the Dorsey orchestra’s personality. 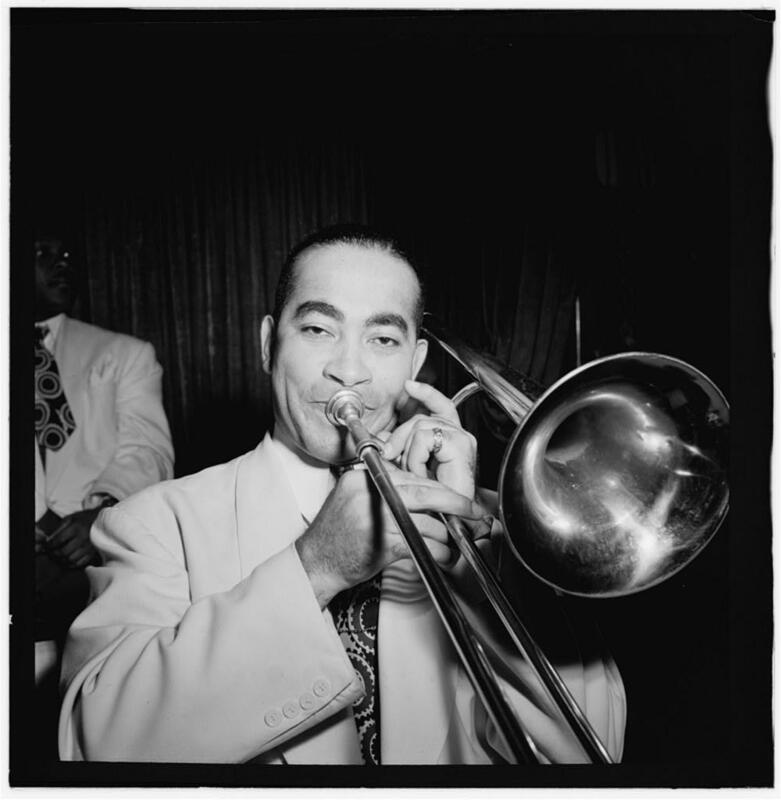 There was also romantic, mood music often featuring Dorsey’s smooth, lyric trombone. 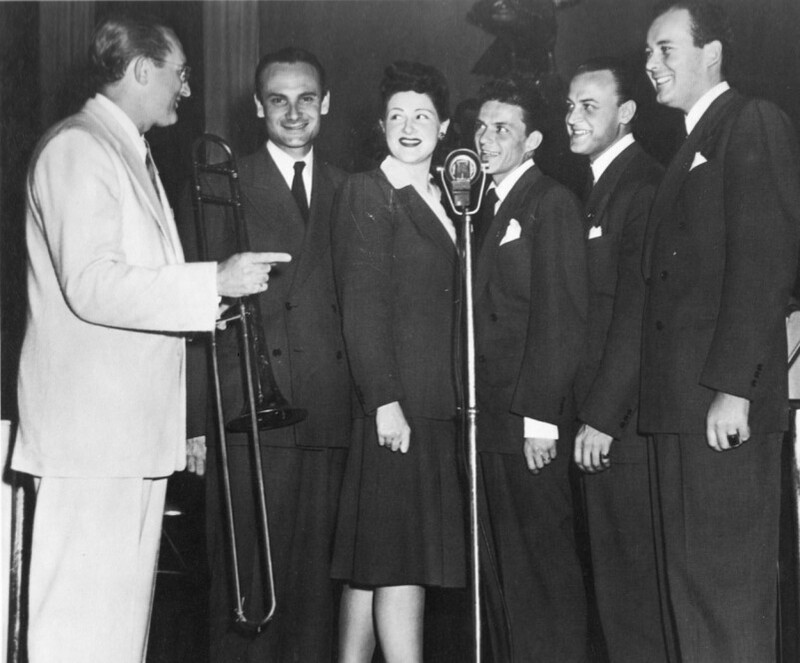 To enhance the sweet side, Dorsey brought in some new singers: Jo Stafford and the Pied Pipers; and that skinny kid from trumpeter Harry James’ band, Frank Sinatra. 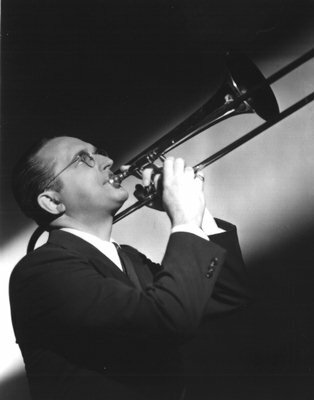 The arrival of trumpeter Ziggy Elman was the last important addition to Tommy Dorsey’s greatest band. 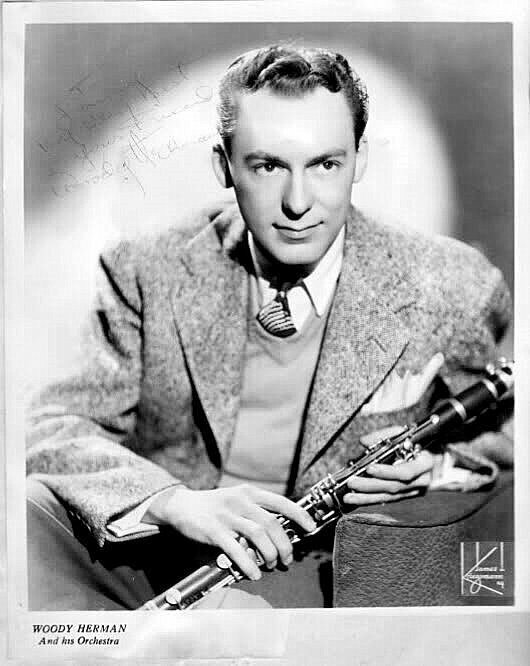 A spirited and effusive musician, he had been a member of Benny Goodman’s classic 1936-39 orchestra, although for most of the time he was stuck in the shadow of Harry James. 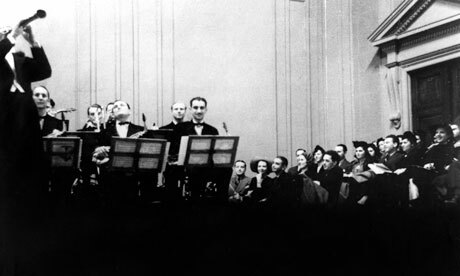 After Goodman temporarily disbanded in 1940, Elman found a new home in the Dorsey band where he dominated the brass and was the featured trumpet soloist. The sweet, romantic side of the band can be heard in such timeless records as “I’ll Never Smile Again,” “Star Dust,” and “Everything Happens to Me,” all featuring Frank Sinatra. The band’s powerful swing is represented by Sy Oliver arrangements like “So What,” “Loose Lid Special,” and “Well, Git It!” Although jazz fans loved the Oliver numbers, the vocal ballads were much more popular and sold many more records. Big bands were such big business in the early 40s that Hollywood producers were signing them up for appearances in movie musicals and comedies. 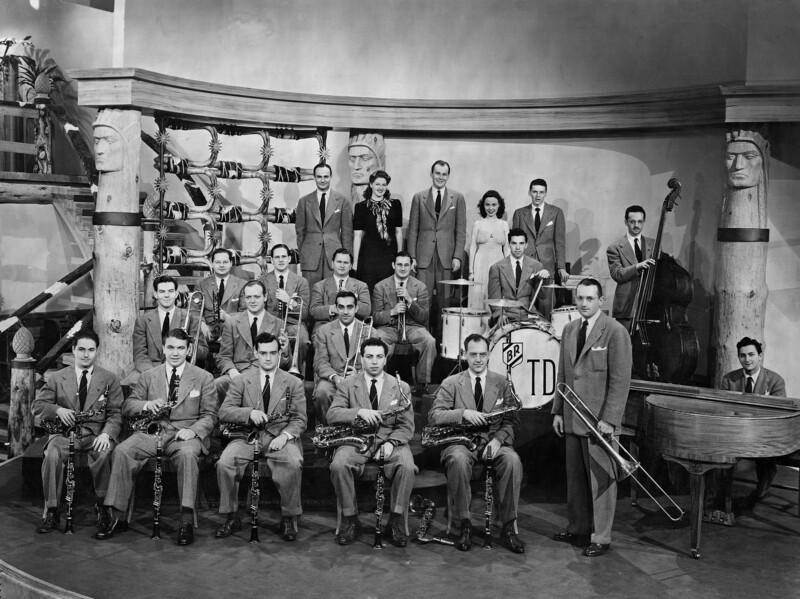 The Dorsey band’s first movie, Las Vegas Nights, came out in March of 1941 and was notable for being Frank Sinatra’s film debut. The band’s next movie was Ship Ahoy, starring tap dancer Eleanor Powell and comedian Red Skelton. One of the big production numbers in the movie is “I’ll Take Tallulah.” (Powell’s character is named Tallulah.) Dorsey’s band does little more than provide accompaniment, but Buddy Rich gets to participate in Powell’s dance routine. Dorsey has a speaking role, but he’s stuck with hokey lines that were a Hollywood writer’s idea of how jazz musicians talked. (“Don’t tell me you’re from squaresville.”) The man walking in with the bevy of beauties is Bert Lahr. Half-way through the shooting of the Ship Ahoy, Tommy Dorsey, Buddy Rich and Frank Sinatra attended an all-night party at actress Lana Turner’s home. According to Dorsey biographer Peter J. Levinson, the party broke up the next day when Turner’s mother showed up with the news of the Japanese attack on Pearl Harbor. But in July 1942 this greatest of all Tommy Dorsey bands made its last commercial records. Because of a dispute between the musicians union and the record industry, a ban on recording strike went into effect on the first of August. Dorsey’s label RCA Victor didn’t settle with the union until over two years later. At the end of September, Frank Sinatra left, taking arranger Axel Stordahl with him. Meanwhile the military started taking Dorsey’s musicians. Trumpeter Ziggy Elman was drafted and entered the army air corps. Buddy Rich joined the Marine Corps. But before the band fell apart, it starred in the M-G-M Musical DuBarry Was a Lady. In this scene, the band plays one of Sy Oliver’s jazz arrangements, “Well, Git It!” The soloists are Ziggy Elman and Jimmy Zito, trumpet; Heinie Beau, clarinet; Don Lodice, tenor sax; and Buddy Rich, drums. 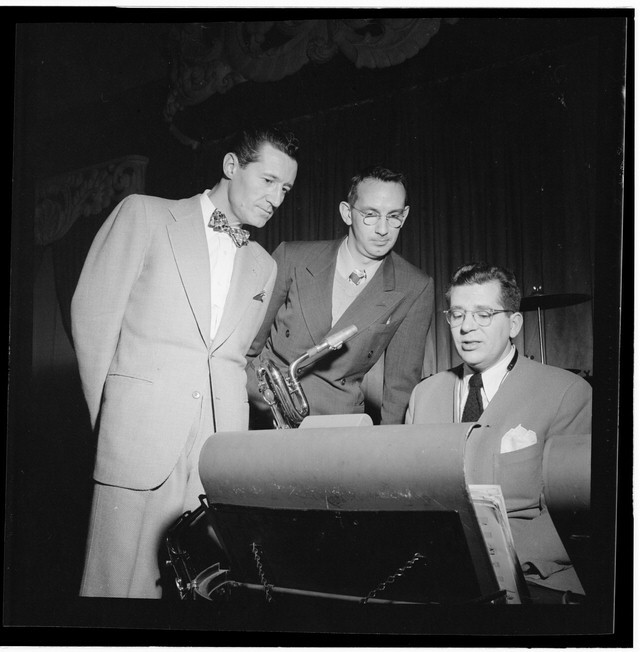 The pianist is Milt Raskin who is joined on camera by an unknown player. The pre-recorded track actually features Raskin and ex-Dorsey pianist Joe Bushkin. The record ban ended in November of 1944 around the time Buddy Rich returned from the service. There were still a few more great records like Oliver’s “Opus One,” but Dorsey’s glory days as a popular bandleader were coming to an end. He reunited with brother Jimmy in the early 50s and together they had their own television program. On January 18th, 1956 they introduced a new singer form Mississippi, Elvis Presley. Ten months later, Tommy Dorsey was gone. More than any other big band, the Duke Ellington Orchestra was a collection of unique and diverse musical personalities. In choosing the men for his band, Ellington picked players with distinctive sounds and approaches to their instruments. Like a great painter, he mixed these various colors and textures to create inventive and breathtaking art. Ellington’s musicians weren’t mere sidemen. They were inspiring collaborators and irreplaceable hues in his orchestral palette. Among the most important was trombonist Lawrence Brown whose smooth ballad playing and virtuosic jazz solos were an integral part of Ellington’s sonic world. This week on SDPB Radio’s Big Band Spotlight, we’re featuring Lawrence Brown in recordings from his three decades in the Ellington orchestra. When Brown joined Ellington in 1932, he brought a creamy, smooth sound to a band that was often gritty and earthy. Not for nothing was the early Ellington band’s music described as “jungle music.” Brown was one of the first jazz trombonists to play in a lyrical, legato style that broke from the rough, smeary, almost comic sound of New Orleans trombonists. Lawrence Brown was born in 1907 in Lawrence, Kansas. His father was a minister and his mother played organ in their church. When he was seven, his family moved to California. In school he played around with the piano, violin, tuba and saxophone before taking up the trombone. He thought the trombone had a tone similar to a cello and decided to pattern his style on the sweet sound of the cello instead of the loud, raucous, raspy playing of other trombone players. So the young trombonist left home and played for various bandleaders in and around Los Angeles. In the early 1930s, he was a member of the Les Hite Orchestra, which played at Sebastian’s Cotton Club in Culver City. The band’s drummer was Lionel Hampton. The featured attraction was Louis Armstrong, who, Brown said, was the only musician who had an influence on him. Brown quit after Armstrong’s manager called a rehearsal on Easter Sunday. He didn’t work on Sundays because that was the day he visited his parents. But it just so happened that Duke Ellington’s Orchestra was appearing in Los Angeles at the time. Ellington’s manager Irving Mills had heard Brown play at Sebastian’s Cotton Club and recommended him to Ellington. Despite the warmth of his playing, Brown was a rather aloof man who rarely smiled. He was sober and straitlaced and never drank, smoked or gambled like most of the other guys in the band. When he met friends at a bar, he’d have Coke and buy them a whiskey. His nickname was “Deacon” and “Reverend” or simply “Rev.” Ellington cornetist Rex Stewart, who was also a fine writer, compared Brown to a Baptist who wandered into the wrong place seeking converts. His manner was no doubt inherited from his minister father, who was never happy about his son going into the music business. Like other musicians in the band, Brown was unhappy when Ellington took credit for music he wrote. 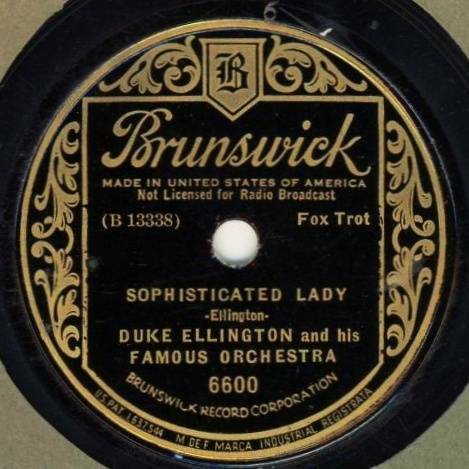 The trombonist always claimed he came up with the A section of one of Ellington’s biggest hits, “Sophisticated Lady.” He and saxophonist Otto Hardwicke, who Brown said wrote the bridge, sold their portions of the songs to Ellington for fifteen bucks. 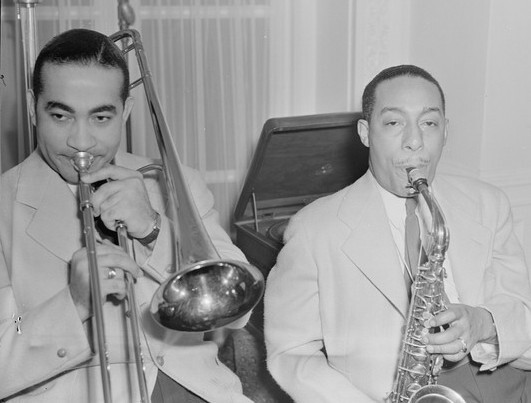 By 1946 Lawrence Brown was the only one left of Ellington’s legendary trombone trio. Juan Tizol had already been gone for a couple years and “Tricky Sam” Nanton died that summer. The loss of these musicians, and others, changed the character of the Ellington band, which only made Brown’s presence all that more important, especially to fans who longed for the Ellington bands of the past. But in 1951, Lawrence Brown, alto saxophonist Johnny Hodges and drummer Sunny Greer stunned the jazz world when they quit the Ellington and formed a new group under Hodge’s leadership. After nineteen years, Brown was tired of playing the same old thing night after night, show after show. He and Hodges both wanted the freedom to stretch out and play jazz in a small group. 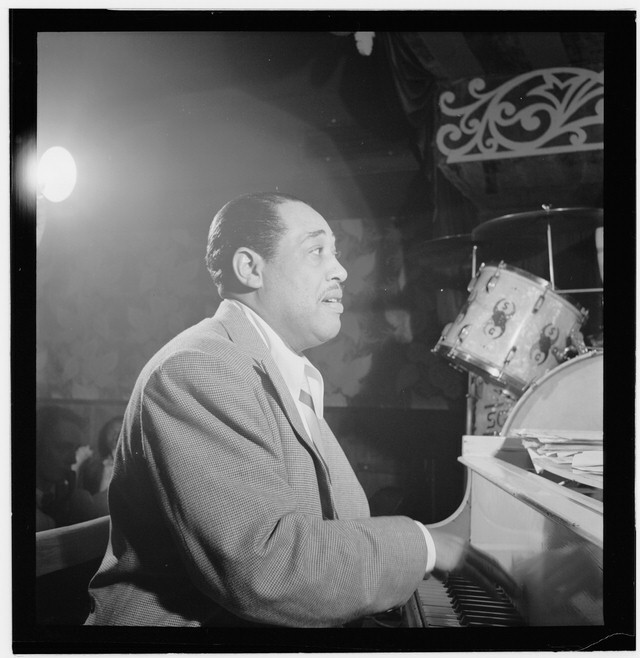 In the summer of ’55, though, Hodges returned to the Ellington fold while Brown became a freelance studio musician. But Brown’s musical individuality, a plus in the Ellington band, was a minus in the studios where all the musicians needed to sound alike. So like Hodges and another prodigal son, trumpeter Cootie Williams, Brown found himself back in the Ellington band. He rejoined in 1960, but wasn’t happy with the new role Ellington assigned him: growling mute and plunger specialist, like his old colleague “Tricky Sam.” Brown resented Ellington for making him play that style of trombone, saying it messed up his lip and destroyed his own, more lyrical approach. Brown left Ellington once more in 1970, but this time it was for good. On his way back home to California, he stopped to visit an aunt in Cleveland and left his trombone behind her rocking chair where, he said, it stayed. He quit the music business and no one could persuade him to pick up his mellifluous trombone again. When the late Ellington scholar Mark Tucker visited Brown in 1985, three years before the trombonist’s death, he met a gloomy and bitter man. Brown refused to glamorize or romanticize his years with Ellington, calling him an egomaniac and an exploiter of men and a seducer of women. For Brown it had just been a way to earn a living – and not a particularly admirable one. He told Tucker that his decision to join Ellington and leave California was a regrettable mistake; the beginning of the end. Tucker found Brown, the man, the opposite of the sweet, elegant, noble and romantic sounds that came out of his horn. But Tucker suspected Brown’s resentment of Ellington stemmed partly from his awareness of how much he owed him. There don’t seem to be any film clips of Lawrence Brown playing his Ellington features like “Rose of the Rio Grande,” but this 1962 video of “VIP Boogie/Jam with Sam” has Brown playing a short solo after about four minutes. The group dynamics of a big band were such that one musician could have an oversize impact on a group’s sound and spirit. Benny Goodman was already leading the hottest band in the country when Harry James joined, but the fiery former circus trumpeter spurred the orchestra to an even higher level of swinging excitement. With James on board, the Goodman band reached its peak of popularity with screaming teenagers crowding the bandstand and dancing in the aisles. This edition of his band was the one Goodman called his favorite. This week on SDPB Radio’s Big Band Spotlight, we’re featuring a handful of Harry James’ classic performances during his two year tenure with the King of Swing. Harry James was born in Georgia in 1916. His father was a formidable trumpeter and the bandmaster of the Mighty Haag Circus, a show that toured the south and southeast. His mother was an aerialist who, according to legend, was still performing on the trapeze a month before Harry was born. His first took up the drums before beginning trumpet studies with his father at the age of eight. A year later he was working in his father’s band and by the time he was twelve he was leading circus bands himself. His early experience playing circus marches gave him an iron lip, dynamic range and a remarkable, virtuosic technique. But we need to be careful not to give all of the credit for the Goodman’s band’s energy and spirit to James. Gene Krupa’s exuberant drumming was the band’s engine; James just increased the horsepower. Benny Goodman and his brass section. The trumpeters left to right are Harry James, Ziggy Elman and Chris Griffin. James also wasn’t the only great trumpeter in the band. He shared the section with another fiery soloist, Ziggy Elman, as well as the versatile Chris Griffin. Together the three formed what was called a “powerhouse trio.” Griffin remembered Duke Ellington calling them the greatest trumpet section that ever was. 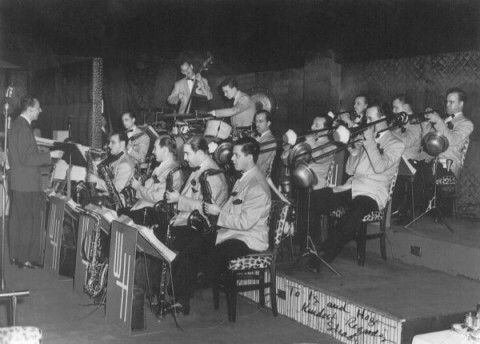 Glenn Miller said the section was “the Marvel of the Age.” While it was customary in most big bands for one trumpeter to play lead and the others second and third, James, Elman and Griffin traded parts since each of them could read and play jazz solos. Plus they had to switch things around so they wouldn’t blow their lips out playing all the high notes in the lead parts. Although Benny Goodman had been leading a band for over two years when Harry James joined, the young trumpeter’s arrival coincided with his orchestra’s peak of popularity. 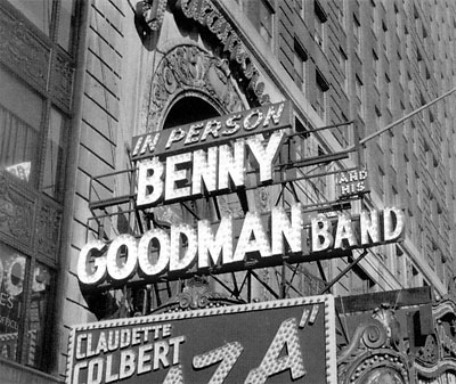 In March of that year, the Goodman band had a two-week engagement at the Paramount Theater on Times Square. No one was expecting anything special, but when the band showed up for rehearsal the morning of opening day, Goodman’s musicians were surprised to see hundreds of mostly young high school students lining up at the box office. The Paramount had a rising bandstand and as the Goodman orchestra came into view playing its theme “Let’s Dance,” fans jumped to their feet and screamed. Some scurried into the aisles to dance and others crowded around the bandstand. Goodman had to tell his enthusiastic fans to quiet down so the band could play. It was a scene repeated wherever the band went throughout the country as the year went on. Some seventy-five years later with all the changes in music that have occurred, it might be difficult to understand what all the fuss was about. Like so much pop music over the subsequent decades, the Goodman band’s music was energetic and danceable. At the heart of it all was a driving beat, powered by Gene Krupa’s spirited drumming. And the band was loud with Harry James’ fiery trumpet solos serving the same role played by electric guitarists in the hard rock bands to come. The biggest triumph for this edition of the Goodman Orchestra came in January of 1938 with a legendary concert at Carnegie Hall. But it also turned out to be something of a last hurrah. Gene Krupa and Goodman weren’t getting along and a month later the drummer quit the band following a date in Philadelphia. According to band pianist Jess Stacy, the conflict between the two grew as Krupa emerged as the band’s big star and showman. Krupa and Harry James were crowd- pleasers while Goodman was more aloof and believed that playing a great solo should be enough to satisfy audiences. It was legendary record producer and erstwhile Goodman advisor John Hammond’s belief that the split was over the music Krupa’s exhibitionistic showmanship was forcing the band to play. Goodman was frustrated that the public seemed to want noise and crazy antics instead of good music. Although the core of musicians who played with Goodman at Carnegie Hall still remained at the end of the year, it didn’t really sound like the same band anymore. Its music was slipping and fans were turning to the other swing bands that had formed in the wake of Goodman’s great success. 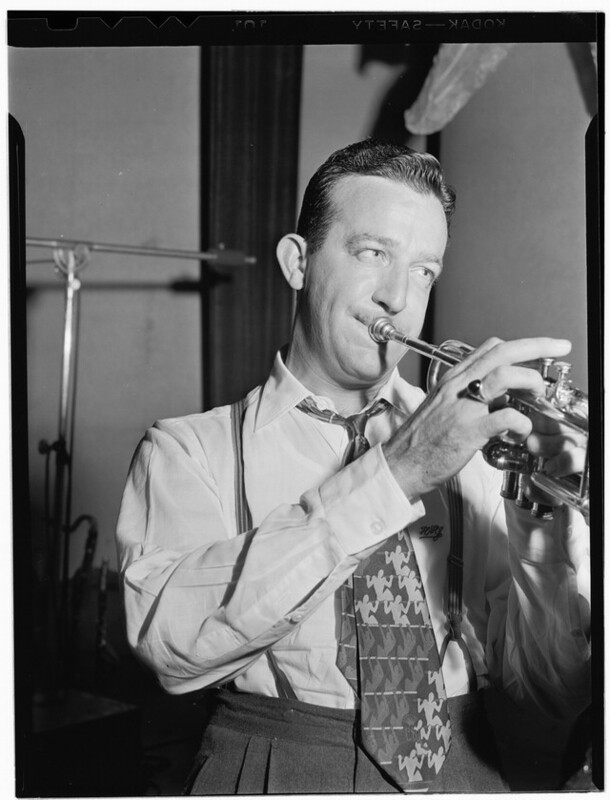 Harry James was now a big star and making plans to start his own big band. James played his last radio broadcast with the Goodman band on January 10th, 1939. Jess Stacy said that when the trumpeter left, Goodman would never admit it, but the guys knew something was wrong and the band was never the same. Goodman went into a slump, but he brought in new musicians and arrangers, revamped his style and by 1941 had what I would argue was his greatest band. James faced struggles of his own after leaving Goodman and forming his own orchestra. He had some lean years, but by 1943 was leading the most popular band in the country. But his tremendous popularity wasn’t built on his fiery jazz trumpet, but on romantic ballads capturing the spirit of the World War Two years. The common images of the great Swing Era bandleaders include dazzling trumpeters with gleaming horns; handsome young clarinet virtuosos; and elegant pianists conducting from the keyboard. Singers were an important part of every orchestra’s success, but few of them were bandleaders. This week on SDPB Radio’s Big Band Spotlight we’re featuring music from a handful of the most prominent singing bandleaders, including both vocalists only and and instrumentalists who also sang. 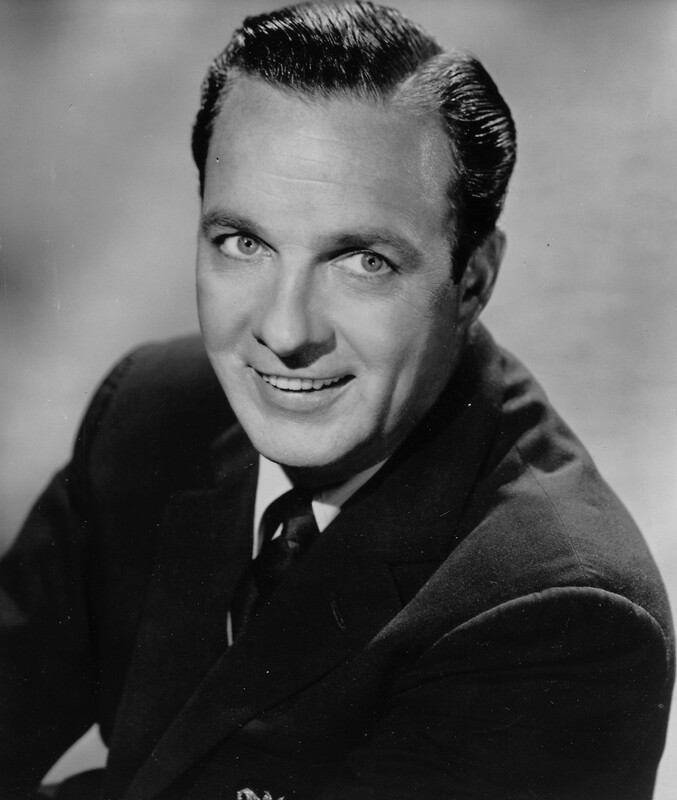 Bob Crosby is in the former category. The younger brother of Bing, he became a bandleader when refugees from the Ben Pollack orchestra asked him to front their new band. It was a great group filled with outstanding musicians with a penchant for classic New Orleans jazz. Crosby didn’t have much to do with the band’s music, though. His role was to serve as the public face of the band. As he said years later, “I’m the only guy in the business who made it without any talent.” While he was being modest, his singing was no match for his brother’s, although he possessed the same sort of warm baritone. That tepid compliment aside, it’s only his band’s instrumental records that anyone needs to hear today. Cab Calloway, on the other hand, was a remarkable singer who led a spectacular, hard swinging big band. Even though he didn’t play an instrument or write music, he wasn’t just an entertaining front man. Throughout the thirties and forties he filled his orchestra with such outstanding musicians as trumpeters Dizzy Gillespie and Jonah Jones; tenor saxophonist Chu Berry; bassist Milt Hinton and drummer Cozy Cole. And they weren’t stuck simply providing accompaniment to their leader’s manic hi-de-hoeing. Calloway made sure they had great arrangements to play and room to blow. Here’s a clip of Cab Calloway and his great orchestra in a clip from the 1943 movie Stormy Weather performing “Jumpin’ Jive.” This is mostly a showcase for the phenomenal dancing of the Nicholas Brothers, but you can hear, and see, this great band in action. Although primarily known as a smooth, ballad singer, in the mid-1940s Billy Eckstine led a startling, groundbreaking orchestra that was the first big band to play the modern jazz sounds of be-bop. Eckstine made his reputation as a singer with pianist Earl Hines Orchestra, which in 1943 included both Dizzy Gillespie and Charlie Parker. Eckstine helped lure Gillespie into the band by telling him Parker was about to join, and then got Parker by telling the saxophonist that Gillespie was coming on board. When Eckstine formed his own band the next year, he filled it with young boppers including Parker and Gillespie. Here’s a 1946 clip of Billy Eckstine’s big band playing “Lonesome Lover Blues.” (Both Parker and Gillespie were long gone by then.) The tenor saxophone soloist is a young Frank Wess. The drummer is Art Blakey. Although Ecsktine was primarily a singer, he did play a little trumpet and valve trombone. Among the singing bandleaders who were also musicians was Tony Pastor. As a tenor saxophonist he played in a rather sweet style, but Louis Armstrong inspired his gravelly singing. (His voice was very similar to that of another singing bandleader of Italian heritage: trumpeter Louis Prima. They also shared a taste for Neapolitan novelty numbers.) Pastor was a long-time friend of Artie Shaw’s and was a key member of the clarinetist’s late-1930s bands before forming his own popular group. Here’s a clip of Tony Pastor with his orchestra performing “Margie.” Pastor held on with a big band through most of the 1950s and this probably dates from the early part of the decade. 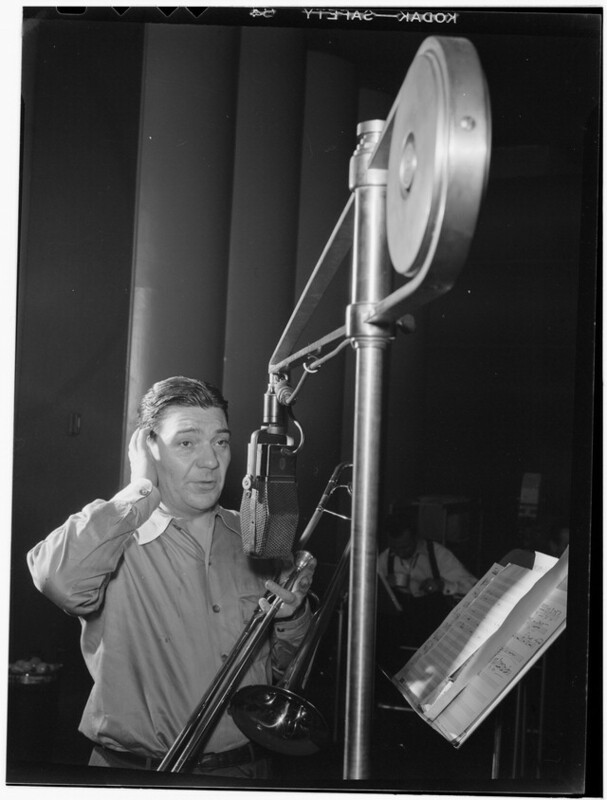 Of all the singing horn players, no one was as remarkable as trombonist Jack Teagarden (other than Louis Armstrong, of course). He had a warm, lazy, legato style of singing that matched his trombone playing. Others have observed, rather facetiously, that sometimes it’s hard to tell when he’s singing or when he’s playing the trombone. But whether singing or playing, Teagarden was always drenched in the blues. As a heavy drinker with no flair for business, it’s astounding that Teagarden managed to keep a big band together for some seven years. His bands were professional, but rather anonymous – except when Teagarden opened his throat to sing or put his trombone to his lips. In his Biographical Guide to the Great Jazz and Pop Singers, Will Friedwald makes the argument that Woody Herman was by far the best of the singing bandleaders. He wasn’t as fine a singer as Jack Teagarden, Billy Eckstine Cab Calloway or Ella Fitzerald (who fronted a band from 1039-1941), but for fifty years he led a series of remarkable bands that stayed modern and served as a training ground for an impressive number of young jazz musicians. As a singer, Herman had a flexible voice and could sing tender ballads or shout the blues. I don’t share Friedwald’s enthusiasm for Herman’s singing and find it an acquired taste at best. I’d much rather hear Herman’s swinging clarinet or expressive alto sax, which was strongly influenced by the great Johnny Hodges. 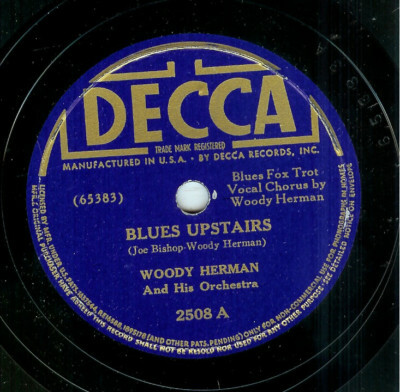 Here’s a 1938 clip of Woody Herman singing “Doctor Jazz” with his Band That Plays the Blues (as it was billed). The most important song for every classic big band was its theme song. Heard at the open and close of live performances and radio broadcasts, themes established a band’s distinct musical character and identity. The best band themes were richly evocative and wove magical, musical spells that haven’t dissipated with the passage of time. This week on SDPB Radio’s Big Band Spotlight we’re featuring theme songs of over a dozen of the most famous orchestras of the Swing Era. To those who grew up listening to the great big bands playing live on the radio, nothing stirs up memories as strongly as hearing a favorite band’s theme song. During the Swing Era, big bands broadcast nightly from ballrooms, theaters and hotels around the country; places with romantic names like Glen Island Casino, the Meadowbrook, Elitch’s Gardens, Cafe Rouge and the Aragon. Because there were so many orchestras competing for listeners up and down the radio dial, a band’s theme had to be distinctive, unique and immediately identifiable. Some bands had rollicking swing tunes as their themes. Count Basie opened his broadcasts with the riff-filled “One O’ Clock Jump.” Duke Ellington used Billy Strayhorn’s “Take the ‘A’ Train” as his theme. Les Brown chose the catchy, energetic “Leap Frog.” Benny Goodman’s opening theme song, “Let’s Dance,” was based on a classical work by Carl Maria von Weber, Invitation to the Dance. 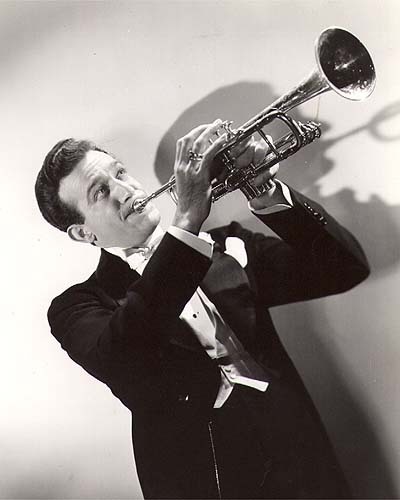 Harry James used the 19th-century Italian tune “Ciribiribin” to show off his soaring, virtuosic trumpet. Jimmy Dorsey’s theme “Contrasts” featured his liquid alto sax. Younger brother Tommy’s theme “I’m Getting Sentimental Over You” beautifully showcased his remarkable, lyrical, upper-register trombone and phenomenal breath control. For those who grew up listening to late night big band broadcasts, I imagine theme songs create the same, powerful waves of nostalgia that later generations feel for the opening themes of favorite TV shows. But no television show ever had a theme that can match the expressiveness and musicality of the greatest big band theme song. Here’s a clip of the Count Basie orchestra playing “One O’Clock Jump” from the 1943 movie Reveille with Beverly. The tenor sax soloists are Don Byas and Buddy Tate. The trumpeter is Buck Clayton and I believe the trombonist is Eli Robinson. Drummer Jo Jones gets a few seconds of camera time and Basie, of course, is at the piano.